Made with rubber nitrile foam designed specifically for impact protection. How are new wrestling mats made? Wrestling mat foam comes in 5' width rolls by many yards long. We lay these rolls side by side and glue them together to form the size mat a customer has ordered. A wrestling mat must have excellent shock absorption, tear resistance, and compression qualities. Therefore, we rely on rubber nitrile foam designed specifically for impact protection. In fact, you'll find this product in football helmets, karate pads, and under artificial turf. Wrestling mats made from Polyethylene foam can't compare to the properties of rubber nitrile foam. 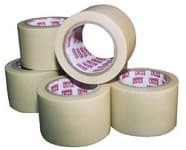 Includes one 3" roll of tape with 10'x10' and two-section 12'x12' mats. 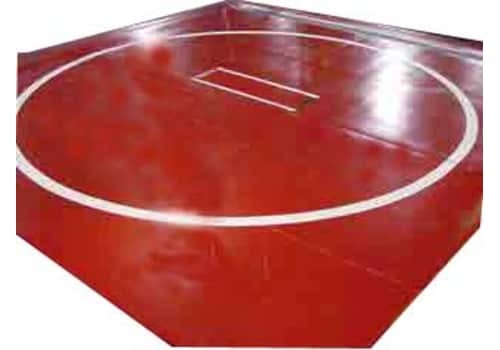 12'x12' two-section wrestling mats come as two 6'x12' pieces with a 10' circle and referee markings. 12'x12' one-piece wrestling mats come with a 10' circle and referee markings. 10'x10' wrestling mats come as two 5'x10' pieces with 8' circle and referee markings. 5'x10' and 10'x10' mats ship via FedEx Ground and 12'x12' mats ship via freight truck. Note: To check availablility of in-stock new wrestling mats that can generally be received within two weeks, please contact customer service.